Despite the Forty-Two Bay Pilgrimage being a tour of bays, the 1710 book '42 Ura no Koritoriuta', lists 'Kizuki Taisha Shrine', rather than 'Kizuki Bay'. The preface to the verses states, ‘In the land of eightfold (countless) clouds, all worship must begin at the Kizuki Taisha Shrine’. So Kizuki Taisha was the start of the bays. In his 1863 memoirs, upon visiting the shrine, Kanazaki Zenbei referred to the bay where Kizuki Taisha was enshrined as ‘Kizuki Bay’. While the pilgrimage can be done heading out from the east, it would appear that historically Izumo Ōyashiro was the original source. Today's Izumo Ōyashiro was originally called Kizuki Taisha, a fact that can be found in the Izumo-no-Kuni-no-Fudoki records dating back to 733. The Nihon Shoki (Chronicles of Japan) refers to the shrine with an alternative name, 'Amenohisuminomiya'. The current name was officially adopted from 1872 onwards. 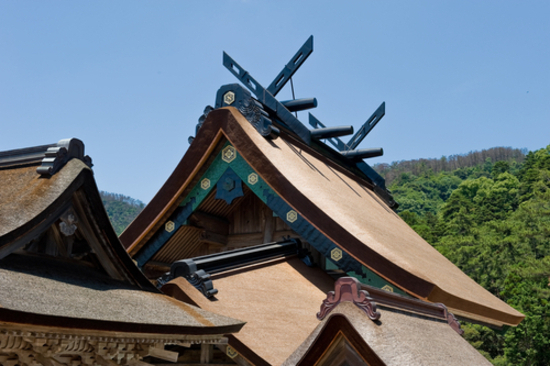 Furthermore, Izumo is the only shrine to bear the name Ōyashiro. It goes without saying that the enshrined deity is Ōkuninushi-no-mikoto, however it is believed that back when the pilgrimage first began, the deity was in fact Susanoo-no-mikoto. In 1666, the bronze torii shrine gate , which makes up part of the fenced walls surrounding the shrine was donated by the feudal lord, Mōri Tsunahiro. Carved on this are the words, 'Susanoo-no-mikoto, the kami (god) of the great shrine of Unyou'. This conjures up thoughts that there may well have been a period when Susanoo-no-mikoto was the enshrined deity at Izumo Ōyashiro. The preface to the pilgrim's verses, 'Unshu 42 ura no eika' carries a line of much significance, 'The great kami (god) of the land of eightfold clouds'. This term 'eightfold clouds' is part of a poem originally attributed to Susanoo-no-Mikoto. At the time of the 1667 'sengu' ( shrine rebuilding that takes place every 60 years in the case of Izumo), the nationwide separation of Buddhism and Shintoism was also occurring. The main hall was rebuilt in its correct form, Ōkuninushi-no-mikoto, the enshrined deity was returned, overall a huge scale reformation was carried out. If one considers the words 'eightfold clouds' to be in reference to Susanoo-no-mikoto, it is possible to make the leap that the Forty-two Bay Pilgrimage may have actually begun not in the Houei era, (1704-11) but back before this period of change in 1667 when Susanoo-no-mikoto could well have been the enshrined deity. There is an old custom on the first of every month to go down to Isano-hama beach, collect drops of sea water in a bamboo pipe as a cleansing ritual. This is known as 'Shiokumi'. Walking down the road where the gods are welcomed back from Izumo , one can see those same bamboo pipes filled with flowers, decorating the entrances to houses. The fundamental connection between the Shiokumi of the Forty-two Bay Pilgrimage and its relation to the heart of the town, Taisha, where people and the gods coexist, can be strongly felt. May 10th, 2013 saw the culmination of five years of reconstruction work on the Izumo Taisha in the form of a traditional Shinto ceremony known as the ‘Hon Den senza sai’. Back in April, 2008, the deity Ookuninushi-no-Mikoto in the form of its ‘Goshintai’ (a representation of the enshrined deity or ‘kami’) had been moved to a temporary resting place ‘O-Kari Den’ following the official transfer ceremony ‘Kari Den senza sai’. Officially, this movement of the kami during rebuilding is called the ‘Sengu’ Such an auspicious event only takes place once every sixty years, the last Sengu being in Showa 28 (1953). This Sengu, under the current Imperial reign is known as the ‘Hesei Dai Sengu’. Following the completion of the Dai Sengu, many important Shinto ceremonies were observed. One of the most important events takes place each year in October when all the kami across Japan gather in Izumo for the ‘Kamiarisai’ (month when gods are present) festival. This time in the rest of the country is described as ‘Kannazuki’ (godless month). In the old calendar in the evening of October 10th for one week, all the gods congregated for meetings with Ookuninushi at Izumo Taisha. 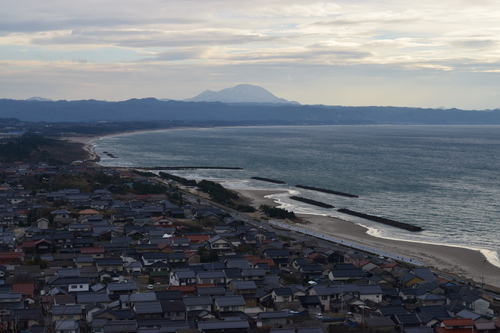 Due to the old calendar, the exact day for this event varies but this year at 7 p.m. on Friday November 23rd a special procession leading to Izumo Ooyashiro began at Inasa Beach. Kami from all of Japan guided across the waters by the kami Ryuuja (the sea serpent) arrived at Inasa Beach. At this beach, one can see ‘Shio-kaki Shima’, an island where the chief Shinto priest performs the ritual of raking up sea salt grains. 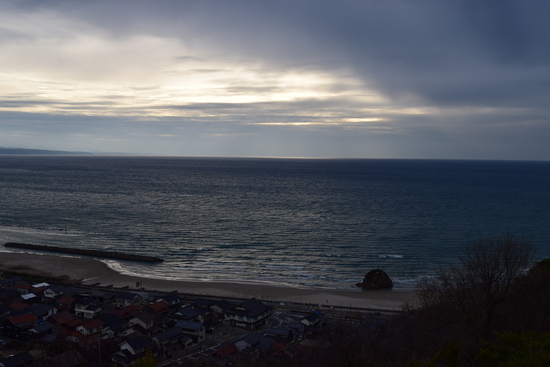 ‘Shio-Kumi’ (gathering of sea water), also takes place here. In the past, during the month when the gods are gathered, rice dumplings named ‘Jinzai-mochi’ were eaten although of late, these can once again be sampled in a small alley named ‘Go-En Yoko-cho’ located in Kanmon Street in the town of Taisha-machi. Within the shrine grounds of Izumo Taisha on the Second Floor of the ‘Shinkokan’ hall, there is a repository housing such national treasures as the ‘Akinoshika makiete’ Box, the sword of Toyotomi Hideyoshi, and the ‘Kogyoku Magatama’ jewel . At the rear of the Main Hall in the ‘Shoukokan’ various statues of gods like Daikokuten, Ebisu and Susanoo-no-Mikoto among other items can be seen. If one is worshipping at the shrine, it is well worth paying a visit to all these areas too. Continuing the tour of the area around Izumo Taisha, to the South –East of the Shinkokan, one finds the Shimane Museum of Ancient Izumo. This is home to an exhibition of what was one of the great Japanese archaeological finds of the century including tens of bronze bells and spearheads which are among the highlights of the discovery. A few hundred meters North takes you to the Manai, a well which is the source of the small stones used for the ‘Hagatame’ ritual which is part of the November 23rd harvest festival ‘Koden Shinjo-sai’. The well water is also available for members of the public to drink. Finally, the base of the rock face at the rear of the nearby Inochinushi Shrine is said to be the location where the jade ‘magatama’ jewel and bronze dagger axes were unearthed during the Edo Period.